Some are wringing their hands about Trump choosing Reince Priebus as Chief of Staff. Understand that there are insiders who have been on the Trump Train that can help the Trump Administration succeed. Some in the TEA Party who wouldn’t get on the Trump Train themselves are now smearing Trump for choosing Priebus because “he’s in the establishment.” Lest you forget, Sen. Cruz is in Washington working with them, too, and though he is in the establishment and works with them he is not of them. There are many in Washington who are good people not part of the corruption. Cruz should be the next Supreme Court justice and Gov. Palin should be Secretary of the Interior, but Trump will pick his own administration and, hopefully, will include some like these two who are the best and brightest and moral leaders. 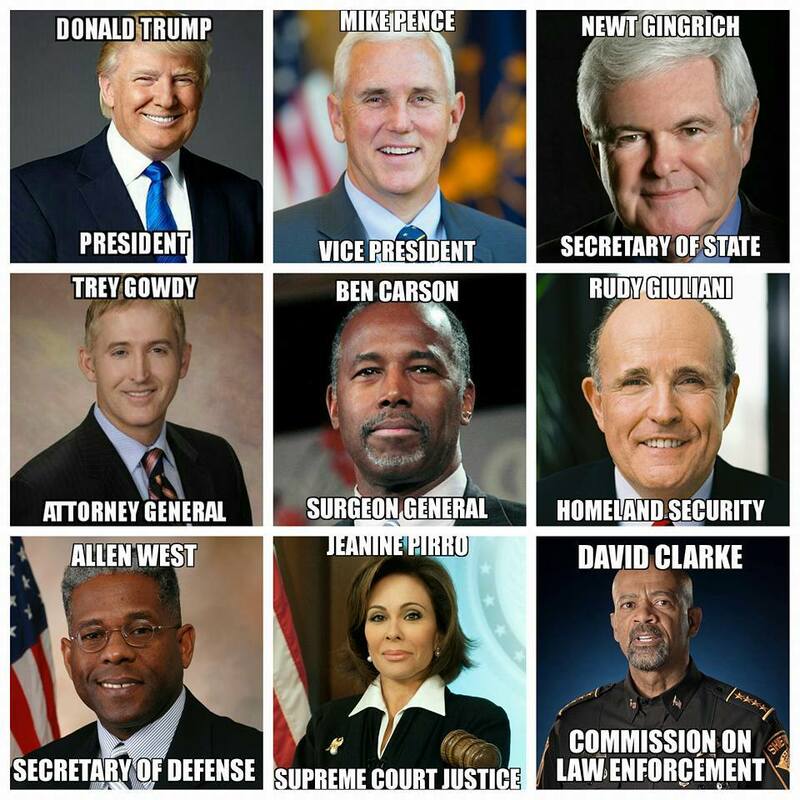 Political pundits are bandying about names of who they believe would be good choices for President Trump’s Cabinet and who should rise in Congress to assist him in achieving the goals Americans voted for in this election. Chairman of the RNC Reince Priebus and Sen. Jeff Sessions backed Trump without reservation and should certainly be at the top of the list. People like Gov. Sarah Palin, Col. Allen West, Mayor Rudy Giuliani, Speaker Newt Gingrich, Gen. Mike Flynn, Sheriff David Clarke, Dr. Ben Carson, and a hundred others have stood with him, if not from the very beginning, at least since he proved he is the fighter Republicans have needed for two decades. Campaign Manager Kellyanne Conway was outstanding, as are his children, and Melania who will make a fantastic 1st Lady are all strong candidates for doing more. But while The Donald is perfectly capable of picking a great cabinet of members who will all work to make America great and safe again, Congress picks its own leaders and there is a battle brewing there. The current Speaker, Paul Ryan, and Senate Majority Leader, Mitch McConnell, have both acted against the TEA Party that lifted Trump to victory. Neither should retain their positions in a Trump presidency lest they sabotage his efforts. Trump needs leaders in Congress who have endorsed him and will back him up, not slow him down with roadblocks to keep the corruption intact. Congressional leaders will be chosen tomorrow to run for their positions. Hopefully, Congress will not work against Trump’s agenda, but with him to produce the results he promised in his campaign. It’s usually easy for D.C. establishment types to set the agenda they want regardless of who comes into the government. But it won’t be so easy to stop The Donald who has proven to be a force of nature unto himself. Where Democrats happily assisted Obama in putting his lawless agenda into effect and Republicans sat back and watched, Republicans may well fight against Trump putting his lawful agenda into effect. As chief executive in charge of enforcing America’s laws, Obama has violated the nation’s laws willfully and with GOP assistance by lack of resistance. Should they now stand in the way of Trump re-establishing America’s immigration laws and undoing Obama’s illegal executive amnesty and energy shut down then there will be more than just hell to pay. The people may call for blood. Patriots already want a deep investigation of the betrayals by Democrats in the Obama regime and into Hillary’s corrupt pay for play racketeering in the State Department. There are quite a few Republican heads that belong in nooses right alongside the people who have deceived and devastated this country. This entry was posted in Election 2016 and tagged Donald Trump, GOP, President Trump, Republican Congress, Trump presidency, Trump's Cabinet. Bookmark the permalink. I didn’t like Mike Pence and he proved to be Trump’s most brilliant pick. Although Priebus is Mr. Establishment RINO Republican, he, unlike his friend, Paul Ryan, stuck with Trump the whole way, including through the Billy Bush fake event. President-Elect Trump does value loyalty and Preibus has exhibited that. If I am going to back Trump, and give him a chance, I must have the discipline to trust his decisions until he does something to breach that trust. So, while I don’t trust Preibus, I would be the first to acknowledge that he has shown 100% loyalty throughout the entire campaign, ever since the Indiana Primary. He even told Mitt Romney, the Bush’s, Kasich and the NeverTrump folks to get behind the nominee or risk losing their funding. He kept his word as Kasich is now out of the Republican Party. President-Elect Trump has a MUCH better track record than I of being able to close and become a successful person. I owe it to him to at least trust him through the swearing in and the first 100 days; so I back him with his selection of the RNC chair even though I don’t trust him (Reince Preibus).